She is a princess with the strength of a warrior. Princess Diya Kumari, born in the illustrious august family of Jaipur, is one of the most proficient women of modern India. With marvelous adroitness she manages her copious business ventures, school, museums and NGOs, while enshrining a large part of her time to developing her constituency of Sawai Madhopur (a large area including Sawai Madhopur City and vast stretches of backward rural areas, along with the Ranthambore National Forest and Tiger Reserve) as an elected Member of the Legislative Assembly of Rajasthan. She was born on 30th January 1971 as the only child of H.H. Maharaja Sawai Bhawani Singh and H.H. Maharani Padmini Devi of Jaipur. Young Princess Diya grew up seeing how a once opulent royal palace, an imperial abode, could become efficiently managed and be given a new intendment with the general public in mind. That was the role that she was to accede to in the future. She studied at the Modern School, New Delhi, and at Maharani Gayatri Devi School for Girls in Jaipur, and later did a decorative arts course in London. Princess Diya Kumari is married to Maharaj Narendra Singh and they are blessed with three children. In addition to being a doting mother of three children, she is a Secretary of two Trusts, namely the Maharaja Sawai Man Singh II Museum Trust, the City Palace, and the Jaigarh Charitable Trust, Jaigarh Fort, Amber. She steers both with vision and fortitude. Other family businesses which entail the Princess’ attention include the ownership and running of two hotels, the Rajmahal Palace in Jaipur, and Jaipur House in Mt. Abu. She manages the Durga Diya Enterprises, the Palace Cafe, and also looks into the management of the Ashok Club, one of the most elite clubs in the country. She also runs two highly prestigious educational institutes of Jaipur – The Palace School and The Maharaja Sawai Bhawani Singh School. She takes a personal interest in managing both the institutes as she feels that education plays a vital role in transforming both individual lives and society as a whole. Princess Diya instituted the Young Achiever in Education award in her name to hearten the youth to outshine in the field of academics. This award is given during the annual award ceremony organised now in the reminiscence of her father the Late Brig. HH Maharaja Sawai Bhawani Singh of Jaipur. A connoisseur of art and culture, Princess Diya Kumari takes a dynamic part in promoting traditional arts, music and dance. She is actively involved in the ‘Friends of Museum’, started by her father His Late Highness Maharaja Sawai Bhawani Singh of Jaipur. Her main focus is to promote the dying arts of Jaipur and support craftsmen linked with it. Various fairs and festivals are organised within and outside the city to provide an avenue to these craftsmen to exhibit their skills and sell their products directly to the customer. Gunijankhana meaning ‘a place for people with values’ was a 17th Century tradition of the Royal Family of Jaipur to endow with a forum for encouraging singers, musicians and dancers to demonstrate their arts. This tradition became defunct in 1949. Princess Diya Kumari revived this royal tradition in 2013. Princess Diya Kumari has been enthusiastically associated with several NGOs and organisations involved in charity and social works. She is involved with the Eye Bank Society of Rajasthan and is also the patron of Rays, an NGO working for HIV+ children. She also monitors the working of Sawai Man Singh Prathmik Chikitsalaya, which aims to provide good medical attention to the common man and to distribute complimentary allopathic medicines to the deprived. 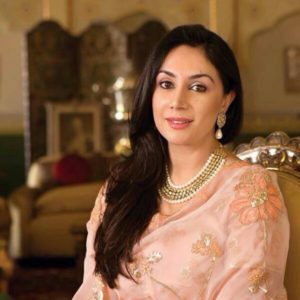 In 2013 she established the Princess Diya Kumari Foundation (www.pdkf.org) with an objective of empowering women through Vocational training, education, and livelihood generation. Needy women, in particular, are being taught various artisanal, handicraft and agricultural skills to make them self-reliant, and to help link their products to the market. Also in 2013, on the assurance of good governance and inclusive development, she was elected a Member of the Legislative Assembly of Rajasthan from Sawai Madhopur, a town that had been founded by her ancestor Maharaja Sawai Madho Singh Ji. In 2014 she was appointed Rajasthan State Government’s Ambassador for the “Save the Girl Child” campaign and was awarded the YFLO Women Achievers Award in Politics by the Young FICCI Ladies Organization(YFLO), New Delhi. Most recently in January 2017, Princess Diya Kumari was conferred upon an Honorary Doctorate Award by the Amity University in Jaipur in the identification of her mammoth contribution and impact in the field of benevolence and playing a lead role in family heritage.